I have a quick comparison post for you of some of the newest raspberry shades from China Glaze. 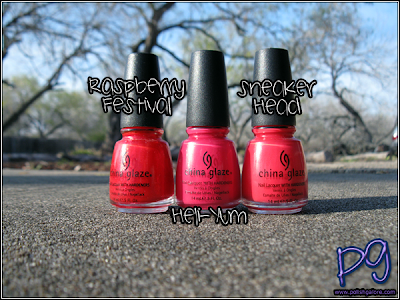 On the far left is China Glaze Raspberry Festival from the 2009 Summer Days collection, in the middle is China Glaze Heli-Yum from the 2010 Up & Away collection, and on the right is China Glaze Sneaker Head from the 2009 Kicks Collection. In the sunlight it's obvious that Raspberry Festival is one of the glass fleck glitter polishes and has a slightly darker base than the others. However, Heli-Yum & Sneaker Head are pretty close to each other - both cremes, both 1 coaters, both the same shade of raspberry. Thanks for the comparison! Heli-Yum is my favorite of those three. It's also one of my favorites from Up & Away, i'm surprised by how much i like it since I figured it would be the most "boring" one I got. I have Raspberry Festival and LOVE it! However, when I took it off like 3 days later, even with a base coat, my nails still had a slight pink color to them. So this may stain the nails for any real amount of time. Thank you for the comparison! They are so pretty! Thanks for the comparisons. I was wanting to see Raspberry Festival swatched. From the pictures at least, I can tell a difference between Heli-Yum and Sneaker Head. SH looks a little more orange to me. Today I'm liking Heli-Yum better, but that may change on a non-rainy day. Nice comparison! I really lovew Heli-Yum, I think it's a fun color but classic at the same time. SH is close but is there ever really a TRUE dupe? ;-) Like you said, I'll take em' all!! I love Raspberry Festival, it's a go to when I need a color pick me up. I think I prefer Heli-Yum over Sneakerhead. Thanks for the comparisons! I've found that Heli-yum is almost an exact dupe for OPI's Yellin' For Watermelon. I swatched them both on my fingers (but forgot to take a picture!) and couldn't really tell the difference between the two. I ended up giving the OPI polish to my sister and keeping Heli-yum. Heli-yum looks really similar to OPI's Dutch Tulips also. I'll have to borrow that from my mom and compare them.